Jesus has come to save what was lost. His death is meant to save the entire humanity. The conversion of the Samaritan woman brought forth the conversion of others. Today’s Sunday readings present to us the spiritual symbol of water, its purifying and cleansing effect on the soul. In the 1st reading (Ex 17:3–7), the people of Israel in the desert, thirsty after their journey from Egypt fearing for their and their livestock’s lives, and doubting if the Lord is in their midst, complained and asked Moses for water. Moses, following God’s instructions, struck the rock –which symbolizes Christ, from whose heart will flow spirings of living water (Jn 7:38)– of Horeb with his staff and water flowed from it for the people to drink. That “living water” is “the love of God has been poured out into our hearts through the Holy Spirit who has been given to us” given to us in the Sacrament of Baptism with which we have received God’s grace, the remission of original sin, and have become children of God, saved by the “love that led Jesus Christ to die for us sinners” as we read in the 2nd reading (Rm 5:1–2, 5–8). 2. Jesus has come to save what was lost. His death is meant to save the entire humanity. Jesus’ meeting with the Samaritan woman as described in the Gospel is not insignificant. It is well-known that the Jews and Samaritans avoided dealings with each other for centuries, most especially in food and drink for the latter’s adoption of 5 pagan male idols whom they worship as Baal. 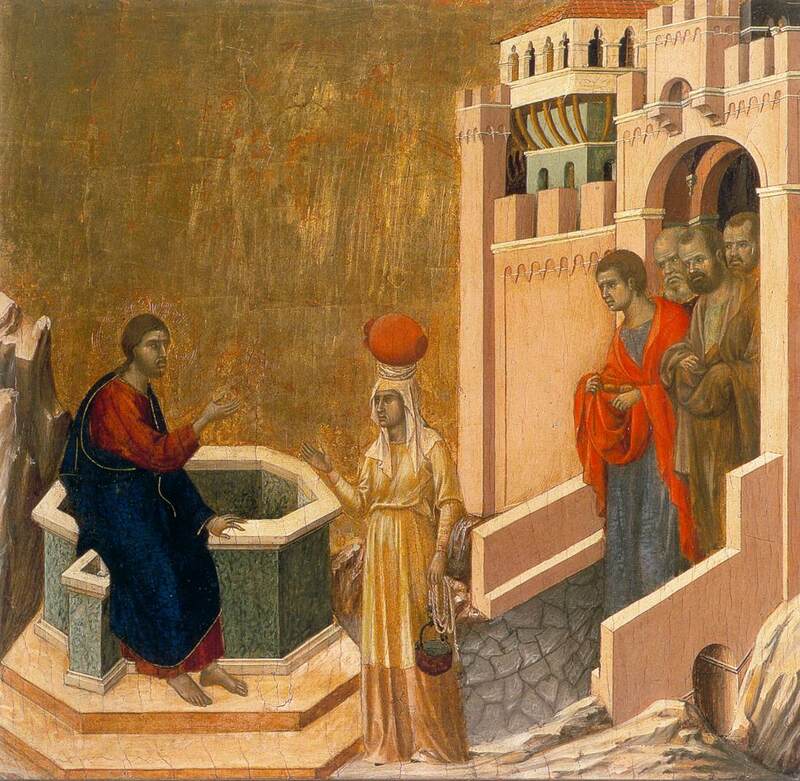 The fact that Jesus asked the Samaritan woman to “Give me a drink” and the intimate dialogue which ensued thereafter manifests the universality of Our Lord’s salvific mission. The woman had a difficult marital life: she had 5 husbands, – a fact which she didn’t tell Jesus but He knew anyway, – which represent the five foreign tribes who intermarried with the northern Israelites (Samaritans) introduced five male deities into their religion (cf. 2 Kings 17:24-31), thereby making them unfaithful to the covenant with Yahweh and caused the animosity between them and the Jews. But Jesus was interested in all souls, especially those who are in most need of His mercy and salvation. 3. The conversion of the Samaritan woman brought forth the conversion of others. The Samaritan woman, representing all who have not received Christian Baptism, had all the traits which allow Christ’s grace to enter in one’s soul. She was sincere and truthful, further opened up her heart to him admitting that “I have no husband” (v. 17); and makes an act of faith: “I perceive that you are a prophet” (v. 19). As water is absolutely necessary for human life, much more is Christ’s living water, the baptismal grace, absolutely necessary for man’s salvation. Let us through our daily struggle for conversion, our prayer, fidelity to Christ’s teachings and personal apostolate of friendship be instruments to bring souls to Christ so that their thirst for salvation may be quenched by the living water of Christ, his grace which provides eternal life. A Blessed Sunday and week ahead! Cordially inviting you to like and follow our page, www.facebook.com/Catholicsstrivingforholiness and share our posts so we could help more people in their Catholic faith and life. Thanks and God bless! Fr. Rolly Arjonillo.